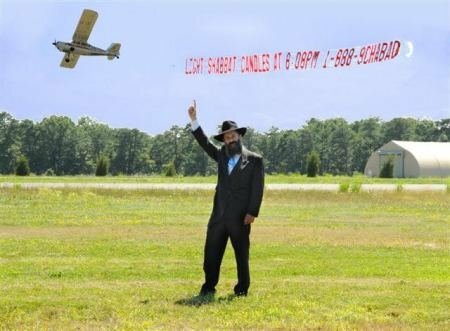 Thousands of weekend visitors to the Jersey Shore will be delighted to see a plane carrying a giant banner announcing the times for Shabbat Candle-Lighting. This project, jointly sponsored by Chabad of Central-South Jersey, Chabad of Rutgers, and Chabad of the Shore, will feature a specially designed artistic sign displaying the candle lighting times, and a phone number and website for further info. Rabbi Yosef Carlebach, director of Chabad stated, "We hope to reach hundreds of thousands of our brothers and sisters as they vacation on the Jersey Shore. We hope that this sign will encourage all to light the Shabbat candles, and bring the Shabbat spirit into their homes. As the Talmud says, "If only the Jewish People would keep the Shabbat, the Messiah would be Revealed", we hope and pray that this Shabbat Campaign will bring the everlasting Shabbat Spirit over all Israel, and all mankind. For further info, or to receive your iwn "Shabbat Candle-Lighting Kit" - featuring candles, matches, and an instructional brochure, please contact Chabad House at 732-296-1800.